began playing D&D in the fall and winter of 1982, I’m sure there were concerns on the part of my family. I’d always been a voracious reader even before kindergarten. I was even starting to experiment with writing some stories in elementary school. But Dungeons & Dragons was one of those strange topics that brought out the conservatives. Thankfully my family, though largely Catholic and conservative, was open minded enough to give me the opportunity to explore D&D with friends of mine in junior high. A group of us from school frequently got together to play on the weekends and had a great time. We spent hours and hours slaying monsters, gathering loot, and exploring the untold depths of maps drawn on scraps of paper. That era introduced my already insane love for reading to the ideas of storytelling, mythology, new terminology, critical thinking, wordplay, roleplaying, and even a bit of philosophy just to name a few things off the top of my head. And all of these different aspects still exist in my life nearly 30 years later. I have D&D to thank for much of who I am today. So… the idea of being able to teach my kids to appreciate gaming in all its forms has been on my mind since my eldest daughter was born in 2001. When we had our second daughter in 2005, I knew we would soon have critical mass for our own tight-knit family gaming group (if I could convince my wife to play, which is more of a case of timing than desire). Now, before I dive back into the benefits of roleplaying games like D&D, I have to bring up the other forms of gaming that we encourage at my house. This probably isn’t a complete list, but we’ve played: Go Fish, War, the Match Game, Connect Four, Blackjack, Candyland, Chutes and Ladders, Sorry, Dungeon!, and Fluxx. What do these games teach? The concept of rules, fair play, friendly competition, strategy, math, taking turns, and a little bit about having fast reflexes. Most of these qualities are necessary for the vagaries of life as well as the ability to have fun in a safe environment for roleplaying games like D&D. Last night instead of playing Dungeonslayers, I used The Haunted Tower from Dragonsfoot.org in conjunction with the amazing simplified kid-friendly D&D 4e character sheets from James Stowe’s site, and we worked through part of the dungeon level of the tower in about 90 minutes of playing time. Though you can see from the image at right that my 6 year old is still getting over the writing hump and math is a bit of a challenge (still not sure how D&D “math” is any different than 1st grade “math” but she’ll get there), my 10 year old easily picked up the concepts from the character sheets – including the idea of “encounter,” “at-will,” and “daily” powers. Though I’m still not a huge fan of 4e, I think it’s perfect for kids as it breaks down things into a much simpler pattern than previous editions of the rules. And the character sheets boil it down even further, which helps my youngest. As far as the awesome “DND for Dads” character sheets go, we are big fans. The “Buried Broken Babydolls” and “Scary Face” spells are my youngest’s favorites, but she has yet to turn any foes into a frog with “I’ll Turn You Into a Frog.” Meanwhile, my eldest managed to use all of her druid’s powers except for actually summoning a toad to the battlefield. Come to think of it, neither girl managed to summon their daily critter (a Zombie Kitty for my youngest). Something to work on next time maybe. I was happy to see that The Haunted Tower included some riddles and puzzles. Personally I love puzzles, but it’s a love/hate relationship most of the time. I can tell my daughters are going to be a while putting some of the pieces together for this adventure, but when they figured out the “See No/Hear No/Speak No Evil” puzzle with the monkey statues in the basement they were quite pleased with themselves. Ultimately teaching my kids to game does three main things. First, it allows me to spend time with them doing something I love to do. Second, they get to put many of the skills they learn in school to the test – reading, problem solving, and math. And third, they get to work on those social skills learning to work together for a common goal. All three are important. All three should be reinforced at home and at school. I just think it’s much more fun to learn while having fun than while crammed into a desk at school. I have the utmost respect for the teachers at my kids’ elementary school. They’ve done an amazing job. And growing up as the kid of two teachers (and with a sister who teaches kindergarten), I know just how much work they all put into it. So helping them out by reinforcing reading, writing, and arithmetic should be something all parents can do at home. So as a parent and a gamer, I hope I’m doing my part to encourage the next generation that playing games is a good way to spend time with family and friends and maybe even learn something along the way. 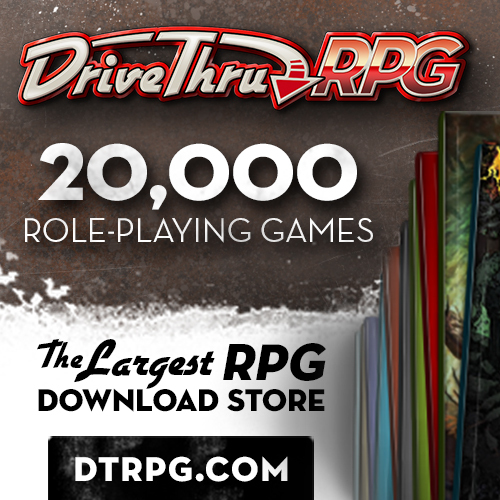 I want to commend the great folks at OneBookShelf (RPGNow/DriveThruRPG and others) for putting this week together. And I hope that Teach Your Kids to Game week continues for a long time to come. Can we have 52 of these things a year I wonder?